Perhaps it’s because they may attain enormous size or maybe it’s because they are so rarely caught, but more myths and lore surround the musky than any other freshwater gamefish. Even the great outdoor writer, Gordon MacQuarrie, helped elevate the musky to legendary status more than 60 years ago when he opined that it was the dollars spent by visiting musky fishermen that built the schools in northern Wisconsin. Muskies are not loners. If plenty of food is available, multiple fish may use a spot. Steve Heiting admires one of 12 muskies he and his partners caught off one particular spot in a week’s fishing. Esox fables are part of the mystique of the lakes country where they are found. However, many of these falsehoods serve as a detriment to not only the anglers who seek them but to the fish themselves. In this article, let’s examine some popular musky myths and bust them open. • “Muskies are the fish of 10,000 casts.” — Maybe they lived up to this reputation in earlier times when there were fewer fish available, and maybe they can seem this way to a casual fisherman, but in this day of an expanded muskellunge range, more knowledgeable anglers and better equipment, if you need 10,000 or more casts to catch a musky, you aren’t doing something right. On September 10, 1998, my partner and I caught 16 muskies in the single-best day of musky fishing we’ve experienced. I’ve also been part of dozens of days when my partner(s) and I totaled five or more muskies. The key is to develop patterns, much like bass and walleye fishermen. Even a single musky follow can help you develop the day’s pattern, and the more variables you can eliminate the faster you will be able to predict your next musky catch. • “Muskies are loners and territorial, and chase away other muskies from their home turf.” — Muskies have been found to feed in pairs and sometimes even in packs. Whether it’s a coordinated effort, as when two smallmouth bass work opposites sides of a sunken log to push crayfish to one another, or merely occurs randomly, is impossible to determine. However, people fishing with me and I have caught muskies on back-to-back casts many times, and once I caught 45- and 46-inchers from the same tiny, eight-stalk cabbage bed in three casts. In a week’s time my partner(s) and I have caught as many as 12 muskies from a single spot, and we didn’t get them all. I’m constantly on the alert for signs of a pack because this can lead to phenomenal fishing as long as the muskies use the spot. The common denominator in every situation in which multiple muskies were using the same spot was the presence of baitfish. If food is available, muskies won’t be far away. • “Cut the leader and it’ll be okay.” — Long the mantra of fishermen who used single-hook rigs with live suckers in the fall, the belief was that even if the musky were hooked in the stomach, the acids in its stomach and mouth would dissolve the offending hook as long as you cut the leader and released the fish. During 2001 and 2002, Wisconsin esocid researcher Terry Margenau conducted a study in which wild muskies were netted from public waters and then released into ponds at the Spooner hatchery. Margenau and other researchers then fished for the muskies with single-hook-rigged suckers. They allowed the muskies to swallow the bait, fought them to the net, cut the leader and released the fish back into the ponds. Margenau found that 83 percent of the muskies hooked in this manner were dead within a year. Necropsies performed on the dead muskies revealed gruesome wounds to their stomachs and other internal organs. Single hook rigs are highly effective, but if you continue to use them after what Margenau proved, you apparently care more for your own success than for the musky fishery. • “Don’t use surface baits until you see baby ducklings start to hatch.” — Topwaters are effective anytime muskies are in shallow water, and I’ve used them successfully from opening day of the musky season until October. Muskies are opportunistic feeders and don’t care — nor do they likely realize — whether a bait is on the surface or just below it. They also don’t have a lakewide memo system that clues them into the first ducklings to appear. However, ducklings can be a sign of good fishing, just as dogwoods or crab apples in bloom usually coincide with crappie spawning. Ducklings appear early in the summer as the water starts to warm, and usually are found in the shallows. 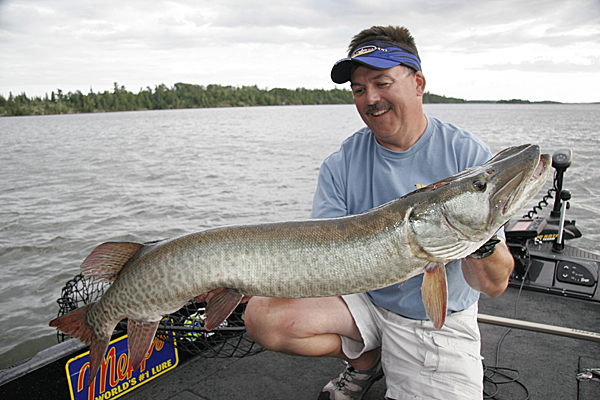 At the same time muskies will often still be holding shallow, and their metabolisms are ramping up with warming water. This is a good time to catch muskies on any lure, not just topwaters. • “Muskies inhabit shallow weedbeds and any you catch over deep water is a fluke.” — Remember what I said about muskies not being far from their food? Many northern lakes are full of ciscoes, and many southern waters are loaded with gizzard shad. Except when these species spawn, they live over deep water and you can bet muskies will be stalking their every move. The fact is, most musky hunters want to target their casts at something, not cast or troll over deep water. I’ve given seminars and written entire articles about fishing for deep water muskies, yet every summer I have these spots to myself. Do yourself a favor this season and treat the baitfish schools you see on your electronics like a giant weedbed. It may take some time but eventually you’ll be rewarded for your efforts with a big musky. • “Muskies eat all the ________ (fill in the blank) in the lake.” Every time I hear this, I wonder how many fish that angler has in his freezer. Studies of musky food preferences have shown that perch, suckers and pelagic baitfish, such as ciscoes or shad, are preferred. Muskies occasionally eat walleyes, bass and other gamefish, but all fish prey upon one another. Muskies that grab a walleye an angler is fighting are merely being opportunistic — a struggling fish represents an easy meal. • “I fought my musky for 15 minutes.” While it may seem that long because of the fish’s size, I found out when I started producing musky-fishing DVDs that fights with muskies — even 50-inchers — rarely last even two minutes. I’ve experienced two 15-minute fights with muskies, but in both cases I was battling a very large fish with extremely-light tackle. No question, the musky is a fish of which stories are told. However, as with all legends, you need to separate fact from fiction.